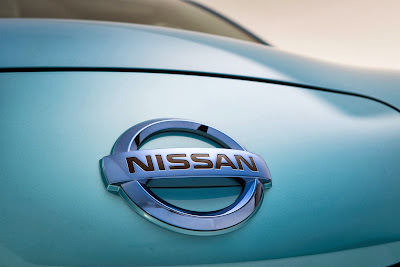 Nissan continues to pioneer the electric vehicle sector with the introduction of the Nissan e-NV200, which brings unprecedented refinement, with zero emissions and ultra-low running costs to the compact van segment With this entry, Nissan will be the first automaker to have two all-electric vehicles in its global line-up, joining the Nissan LEAF, the world's best-selling EV. Combining the best elements of two multi-award winning vehicles - Nissan LEAF and Nissan NV200, past World Car of the Year and International Van of the Year respectively - e-NV200 is ready to change the face of light commercial vehicles forever. The e-NV200's high performance pure electric drivetrain, based on that used in the acclaimed Nissan LEAF, is allied to the class-leading cargo volume of the NV200 to create a practical and versatile vehicle capable of carrying people or goods while producing neither exhaust emissions nor noise pollution. When sales start in June, e-NV200 will be available as a van or as a five-seat people carrier in Combi or more luxurious Evalia guises. Although mainly targeted at businesses, e-NV200 will also appeal to private users with large families. The e-NV200's homologated NEDC range (170kms) is greater than the average 100km daily driving distance of over half the fleets who utilise this class of van and the payload and cargo area is the same as NV200's. "The e-NV200 goes into a totally different market segment to the Nissan LEAF and alongside the world's best selling electric vehicle will help us continue to lead the EV revolution. To do that we haven't simply converted the NV200 to electric, we have thoroughly re-engineered to create a product that isn't just a good electric van, it is a fantastic van by any standards said Guillaume Carter, senior vice president of Sales and Marketing for Nissan Europe. Director of Electric Vehicles for Nissan Europe, Jean-Pierre Diernaz is excited by what the e-NV200 brings to the range, commenting: "The proven and highly effective electric powertrain driving e-NV200 is ideally suited to the typical stop/start daily routine of a working vehicle. 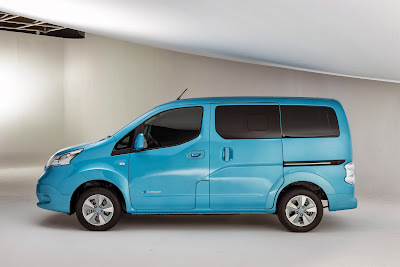 With no exhaust or noise pollution, e-NV200 is environmentally and people friendly, while the lack of fatigue-inducing noise and vibration from the drivetrain coupled with the single-speed transmission will provide genuine benefits to every hard working delivery or taxi driver. Fleet operators, meanwhile, will love the low running costs." Although based on existing hardware, e-NV200 has undergone a full engineering development programme as if it were new from the ground up. The drivetrain has been re-engineered in a number of significant areas to suit its new role, while changes have been made to the vehicle shell to ensure there has been no compromise to NV200's cargo space. A comprehensive ‘real-world' test programme has been undertaken in Japan and Europe with pre-production models handed over to internationally known companies - including FedEx, Coca-Cola, DHL, IKEA, British Gas and the Japan Post Office - to operate as part of their everyday fleets. Feedback from drivers and fleet managers has been used to fine tune e-NV200 before series production began at Nissan's major LCV facility in Barcelona, Spain. "We believe e-NV200 will genuinely change the make-up of light van and taxi fleets as well as changing the environment in the heart of our cities," added Diernaz. 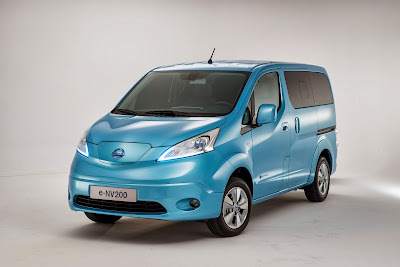 The most obvious visual difference between e-NV200 and its conventionally powered sibling is the adoption of Nissan's EV "face," familiar from Nissan LEAF. The central charging doors and unique blue tinted LED headlights give a modern look and distinct identity from its ICE sibling. Blue-tinted arrow-like positioning lamps sit within new, crescent-shaped, headlamps that incorporate a distinctive ice blue light colour. LED bulbs are used in the rear lights of all versions as well as at the front on passenger models. 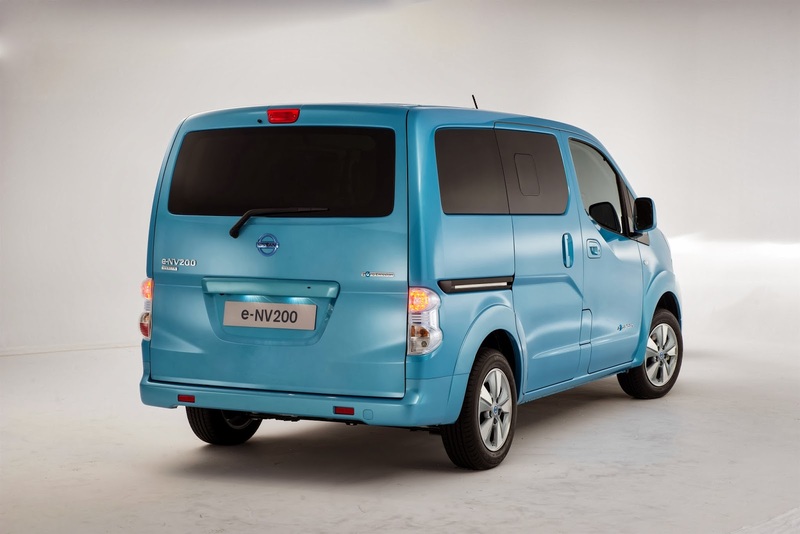 The "electric" blue theme extends to the e-NV200's badging. Inside there's a new instrument panel with a digital read out, while the gear selector has a simplified look and feel - shifting like a conventional automatic rather than the computer-style joystick of LEAF - to help drivers regularly moving from internal combustion engined vans into the e-NV200 acclimatise more quickly. Mechanically, e-NV200 owes much to the Nissan LEAF with independent front suspension by MacPherson strut from the world's best selling EV. LEAF also provides the drivetrain, including its recently introduced second generation 80kW AC synchronous motor, which is now fully integrated with the battery charger and inverter in one compact, self-contained unit. There are some significant changes, however, for e-NV200. Most notable is the Lithium-ion battery which has been changed to allow it to fit under e-NV200's floor without compromising the cargo area. The new pack, which is built at Nissan's plant in Sunderland, UK, and assembled in Barcelona, has the same number of modules - 48 - as in Leaf and the same 24kWh capacity, but is packaged differently. Another drivetrain change over LEAF determined by e-NV200's likely usage pattern is a new braking system with a higher regenerative capacity. This takes advantage of the vehicle's typical stop/start city driving modes, while Hill Start Assist is fitted as standard, holding the vehicle for two seconds after the footbrake is released to allow smooth starting.